Swansea City was hailed as a model club for more than ten years. From a club that was almost down and out back in 2001, a group of fans – the Swans Trust – galvanised the city and worked hand in hand with local businessmen to lift the club from the bottom of the football league in 2003 to the Premier League and Europe by 2013. There seemed little that could go wrong until the riches of the Premier League took hold and the ownership of the club changed hands and the model that had succeeded so often against the odds appeared to be exposed with the club seemingly at odds with its fans and the team struggling on the pitch. In this presentation Phil Sumbler, Chairman of the Swans Trust and author of the book “From Graveyard to Ambition – the official history of the Swans Trust”, will discuss how the model was pieced together and how, after many years in the doldrums, the city rallied behind their football team to compete against all the odds in the money driven world of the Premier League. He will then outline how the environment at Swansea City FC has changed in the past twelve months and the new challenges faced by the Swans Trust – owners of more than 21% of the football club – in working with new owners without any links to Swansea City FC or the city of Swansea, “… and all that after watching the ownership of the club change hands behind their backs by people they had worked so closely with over time”. The Swansea City FC story is a classic rags-to-riches tale in a world dominated more and more by non-local ownership and a view of how fans can play a part in that world. Phil will conclude by speculating what the implications are of Swansea’s experience for the wider supporter ownership movement in the UK going forward. Phil Sumbler has followed Swansea City for almost 40 years. As well as his work on the Trust history he co-penned Vetch Field Voices, 100 Swansea Greats, The Tony Ford Story and Anotehr Day at the Office – the Roger Freestone biography. He has run Swansea’s largest independent website Planet Swans since 2001 and was part of the fans’ groups who rallied against the ownership in 2001. He has been a serving board member of the Swans Trust since 2005 and held the position of Chairman since 2006 during which time the football club has undertaken the most successful period in their history. Sumbler, S. (2013). 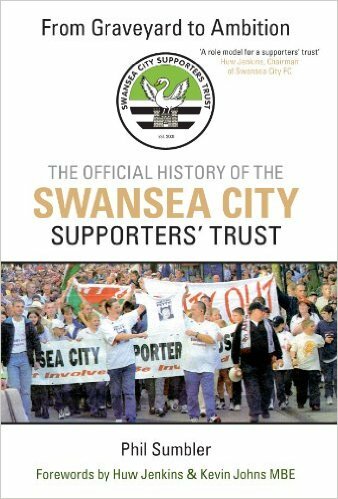 From Graveyard to Ambition: The Official History of the Swansea City Supporters Trust. Amberley Publishing.